I carried a Swiss Army knife for many years. It had two blades—one large and the other small—along with a bottle opener, a can opener, a punch awl, scissors and a corkscrew. You could buy knives with lots of other blades attached, but something about this knife fit my sensibilities. After returning from the Wooden Boat Festival in Port Townsend, Washington, and Lake Union Boats Afloat in Seattle, Washington, I thought of that knife and wondered what its boating equivalent might be. What gave me the idea was the diversity of the boats displayed at those two events. 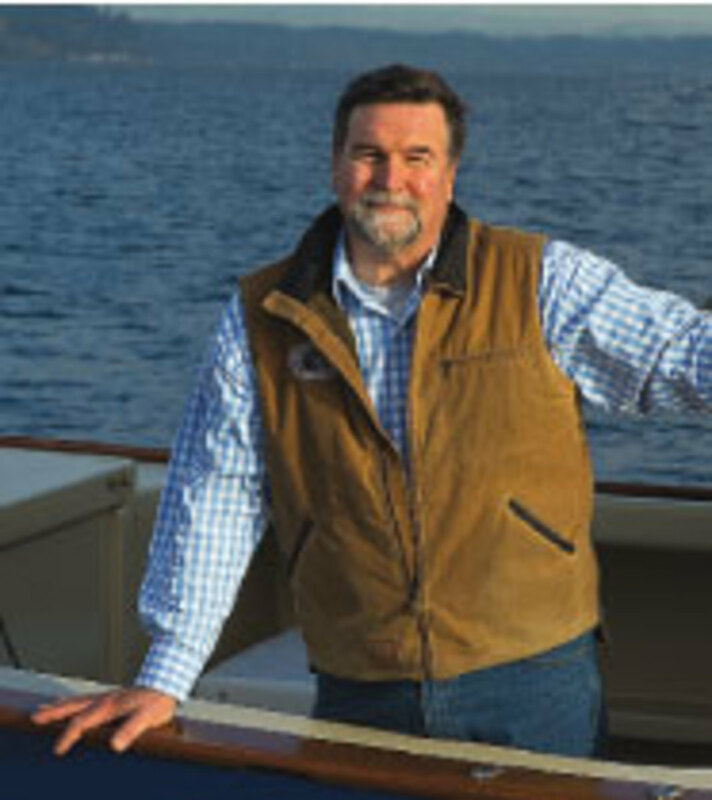 A topic of conversation common to both shows was how to engage younger generations in boating. 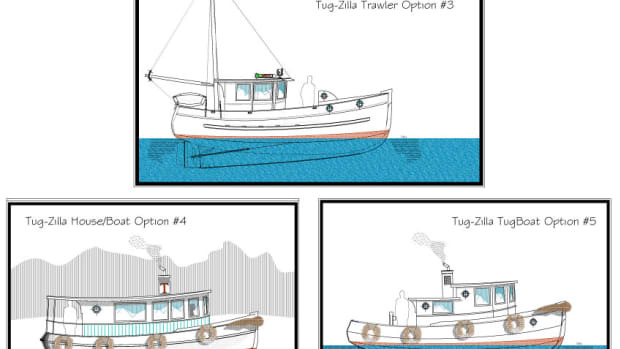 I was thinking about what boats might appeal to those people. I also was thinking about an old and dear friend, Charlie, whose son was coming back to live with him and his new wife in the Northwest. This news was a “special surprise,” according to Charlie, as he had recently remarried and the son had not even bothered to attend the ceremony. 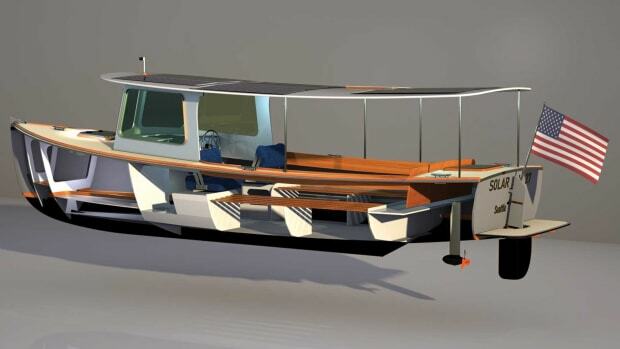 Imagine a teardrop-type trailer that can be placed on a catamaran hull. Charlie, I thought, could use a Swiss Army knife-like boat that his son could live on for as long as necessary. 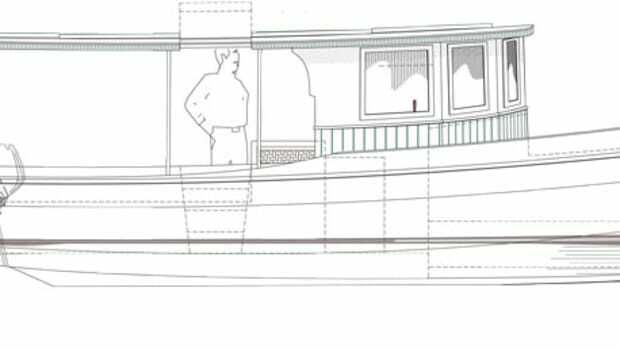 The houseboat idea might have been a winner, but I started on another path of thought, trying to solve the dual dilemma of finding a home for Charlie’s son and a flexible platform that millennials might enjoy. 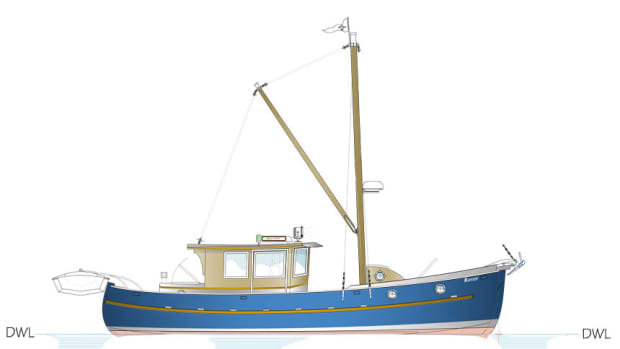 The boat shown here is a small version of what I envision, and it’s usable for a multitude of applications. 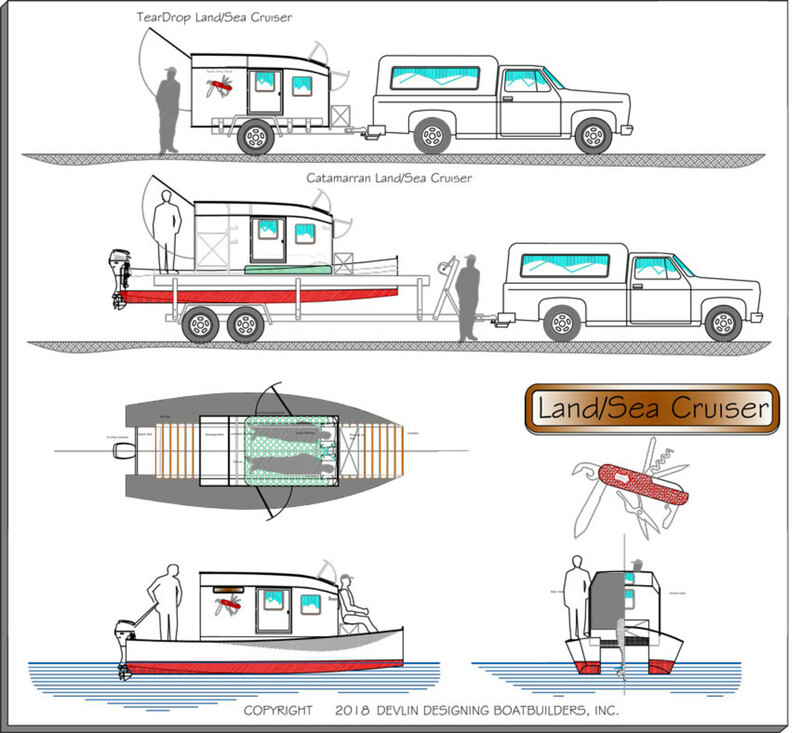 Imagine having a teardrop-type trailer (see next page) that you could park in the yard, camp your son or daughter out in for as much time as necessary, and, if desired, put atop a catamaran hull and cruise into the sunset. I’ve drawn a couple of versions of this design, with the basic camping box common to both versions. On land, you could place the box on cement blocks on the ground for use as an extra bedroom, or mount it to be used like a conventional teardrop trailer. 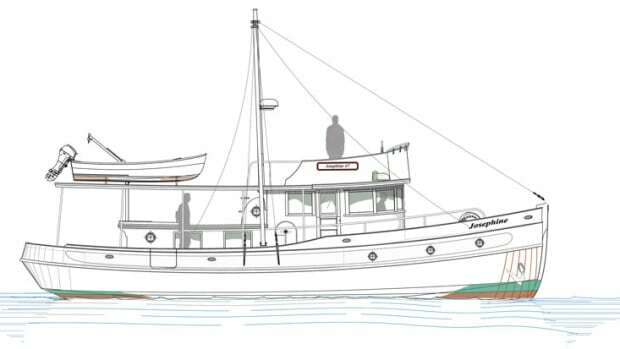 For the sea variation, a catamaran hull measuring 20 feet long and 8 feet, 5 inches wide would make her trailerable without special permits at all hours. Moving from land to trailer to sea could be done with a gantry crane made of bolted-together timbers from the local lumber yard, with the whole camping box weighing just under 400 pounds. With built-in lifting eyes, the gantry crane and a chain hoist could lift up the box and load it onto the trailer or catamaran hull without much fuss. We older sailors could go to a marina and use the lifting eyes and a hydraulic boat lift. Having used a teardrop trailer myself for several years, I’m a fan of “simple is best,” with high-performance coolers and ice for refrigeration, or a cooler-size electric model plugging into shorepower or the towing vehicle. On the front of the trailer or catamaran is a gearbox made of wood and epoxy, or aluminum. It has two functions: stowing gear and being a great seat for admiring the view underway or at anchor. 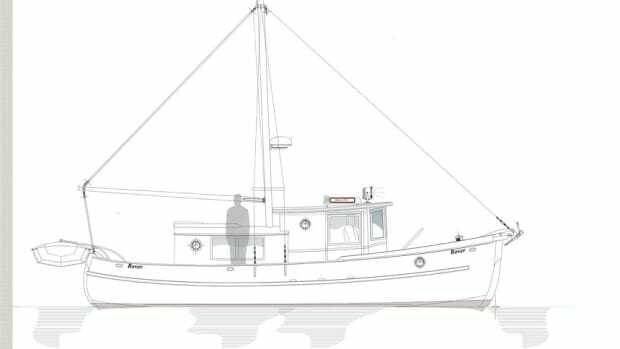 Built to be moved from land to trailer to sea, this 880-pound craft measures 20 feet long, 8 feet 6 inches wide. I have eschewed the normal galley aft on the teardrop, as it really does not get used like a galley in real life. 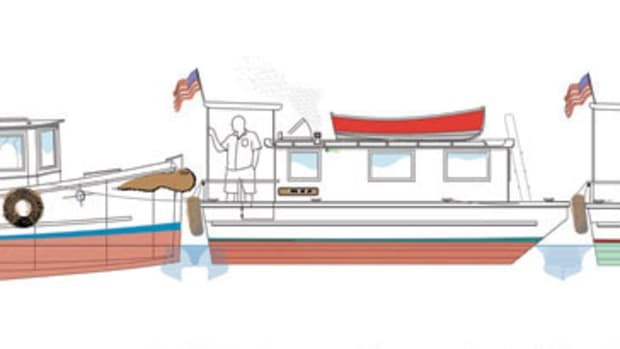 Instead, there’s a hinged flap that, combined with gas shocks, will give a weather or rain break to accessing the stern. This space has room for a couple of coolers and a multitude of stowage boxes. Access into the body of the pod is through two side doors that open to port and starboard. Four 24- by 24-inch hatches are watertight and open for ventilation, and afford reasonable light in the pod. Screens can be fitted in buggy haunts. In these days of low-consumption LED lighting, the pod’s electrical needs are quite simple. One could mount a deep-cycle battery in the stowage area aft. The addition of a flexible solar panel on the pod’s roof could keep the battery charged. The interior holds a queen-size mattress, and a fold-down table hinges into the inside wall. For heat, I would think about a wood stove, which also has the potential of heating water. For anyone near shore power or an extension cord, a ceramic electric heater would be the best option for interior heating. For meal prep, I’d choose a little butane cooker (pretty much the same units that restaurants use for crepes or bananas Foster at tableside). The marine version comes in stainless steel and could be used inside or out. For sanitary concerns, a couple of options could work, one being a compact composting toilet. Another option is a Porta Potti whose tank could be periodically emptied ashore. Simple, propane-powered camping showers could combine with a daily swim or using the facilities on shore. On the water, power for the catamaran could be any type of outboard from 5 to 20 horsepower, with speeds to match. A tiller with an extender would be the simplest steering solution, and a wheel could be fitted. 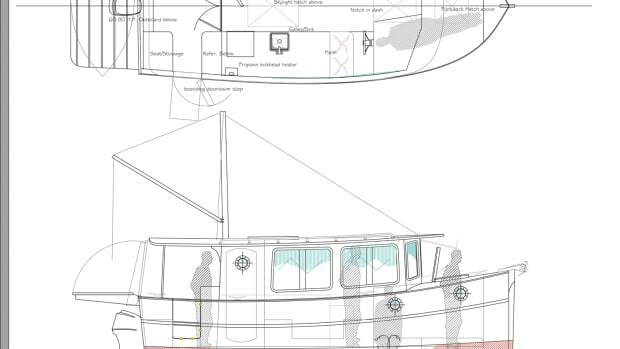 Each hull in the catamaran could have access hatches for stowage containers. Who knows? With a rig like this, maybe more millenials will choose to take to the highways as well as the high seas.